Are Canning Jars OK for Freezing? Question: I'm wondering if I can use glass canning jars for freezer storage. You can use canning jars for freezer storage but you must leave head space. That extra space is critical because if you don't leave enough space when the food freezes and expands it will crack the jar. Also be careful bringing the glass from one extreme temperature to another. Putting a hot jar in the freezer or a frozen jar in the microwave or in hot water can make it break. Canning jars are not my favorite freezer containers because you have to thaw your food to get it out of the jar, unless you get jars with straight sides. Plus canning jars take a fair amount of space and don't stack all that well in the freezer. Square and rectangular shapes are better. So, if you got 'em than use 'em, but don't buy canning jars for the freezer for everyday use. Comments for Are Canning Jars OK for Freezing? Use only wide mouth straight side jars...ones with the shoulders will break all the time.. I have been using canning jars for a long time. I prefer to take my lunch in them, even if they are a little heavier. Eating out of glass is better than plastic. As far as the freezer, if I freeze soup in a canning jar, I take it out the night before and let it partially thaw on the counter, then I place it in the refrigerator for the next day. Takes a little planning but well worth it! Note from Michelle Grace, I love the idea of thawing overnight when you are freezing soup in glass jars. For food safety reason I would encourage people to thaw in the fridge only. It's so easy to leave out something that is thawing on the counter. If food is in the "danger zone" too long it's not safe to eat. The danger zone temperature range is between 49 F and 140 F and in that range bacteria that can make us sick grows fast. Can I use empty jam jars to freeze nuts ? Note from Michelle Yes, you can. Join in and write your own page! It's easy to do. How? 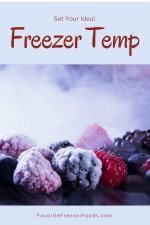 Simply click here to return to Freezer Cooking Questions. See More Great Recipes on Pinterest! 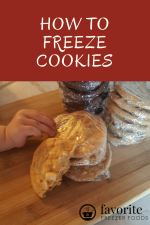 Join the Favorite Freezer Foods email newsletter and receive updates and exclusive freezer cooking tips. You'll also get a printable pdf freezer inventory to help organize your freezer. Is 0F the best freezer temperature for you? Maybe not. . .
Can I Freeze a Half Full Pan? © Copyright 2008-2018FavoriteFreezerFoods.com You can assume when you click a link and buy something that this site is an affiliate and we will be swimming in cash in the Bahamas - or at least make enough to buy a coffee. Learn more about advertising and affiliates on this side on our disclosure page. We are a participant in the Amazon Services LLC Associates Program, an affiliate advertising program designed to provide a means for us to earn fees by linking to Amazon.com and affiliated sites.